For the second in a trilogy of literary adaptations, ERS took on one of American literature’s most daunting challenges: the first chapter of William Faulkner’s The Sound and the Fury. That chapter, known as “the Benjy Chapter,” is told from the point of view of the Compson family’s youngest son. Mute and mentally handicapped, Benjy cannot distinguish between past and present. In prose that is in turns lyrical and confounding, hilarious and tragic, he free-associates his way through his family’s troubled past and longs for his lost sister. With the same radical commitment ERS showed in Gatz, its groundbreaking staging of The Great Gatsby, the ensemble embraced Faulkner’s language and his multilayered narrative. 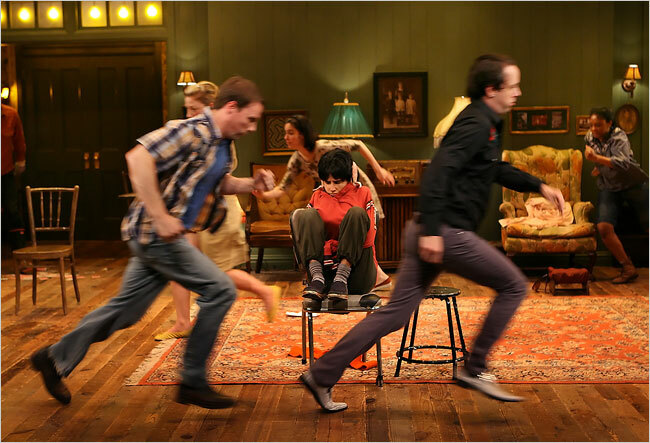 An eerily timeless family living room was the setting for the company’s romp through this dark story. With humor, pathos, high-energy choreography and a wildly versatile ensemble, the company brought this infamous literary masterpiece to life. Originally staged in 2008 at New York Theater Workshop, the production was reworked and remounted in 2015 at The New York Public Theater. Work as Dance Director for 2008 version included choreographic shaping, devising counts, and helping teach movement material primarily generated by two performers to the entire cast. Work as Movement Dramaturg (perhaps not an accurate title in this case) for the 2015 remount included shaping and re-shaping the choreography from 2008, teaching it to several new cast members, and giving performance notes.